There is no doubt that America needs to get its economic mojo back: in the 2nd quarter its GDP grew at an annualized rate of 1.7 percent, according to revised figures published on August 29th. That growth number is down from two percent in the 1st quarter and 4.1 percent in late 2011. But, anyone ready to ascribe that number to mismanagement or competition from emerging economies should consider the state of much of the developed world. Europe remains the cautionary tale with GDP shrinking by 0.2 percent (an annualized decline of 0.7 percent) in the 2nd quarter. The Greeks are on the verge of quitting the common currency and Spain is looking for a bigger bailout. According to the Economist, the research firm Markit is predicting a further fall in GDP in the 3rd quarter. Finland’s economy shrank by 1.1% in the second quarter. The country had been one of the euro zone’s best performers, but the crisis is now starting to take its toll on exports, which account for 40% of Finnish GDP. In July the finance minister said Finland would “not hang itself to the euro at any cost”. The Japanese economy is feeling the European gloom with exports to the European Union falling by a steep 25 percent in the year to July. The only reason their economy grew by 3.5 percent over the last 12 months is because of all the reconstruction work after the tsunami and earthquake. Even the high-flier BRIC countries (Brazil, Russia, India and China) are sputtering. Brazil’s fall from grace has been particularly marked: Brazil’s economy grew at an annualized pace of only 1.64 percent in the April-June period. It is forecasted to grow 1.9 percent this year, less than the 2.15 percent in the U.S. and 2.5 percent expected in Japan. One bright spot  Brazil scored the rare coup of winning the bid for the 2014 World Cup and the 2016 Summer Olympics, leading to $38.1 billion in foreign direct investment this year. Flagging imports suggest that China’s slowdown will prove to be more severe than previously expected. The country’s exporters are also having a hard time. In August, new export orders for manufacturers were at their weakest since March 2009, according to Markit. So, while the campaign rhetoric heats up, with each side blaming the other, it is important to see the bigger picture. A big part of our weak job numbers was that U.S. factory activity shrank for a third straight month in August — because of factors outside our control. Weak demand from China (our 3rd largest market) hits our farmers, IT firms and chemical companies. When Europe contracts, that makes our manufacturing free fall because they buy 20 percent of our exports. In the end, we need to place our woes in context and recognize that the recession is indeed world-wide. International lenders and Greece will renegotiate the program on which the second financial bailout for Athens is based because the original has become outdated, according to a senior Eurozone official. Greece received a €130-billion bailout in February from the European Union and the International Monetary Fund (IMF). General elections in May and June delayed the bailout’s implementation. The United States, the IMF’s largest member, supports discussions to review the Greek bailout program, but German Chancellor Angela Merkel countered that any relaxing of Greece’s reform promises is unacceptable. “Anybody who would say that we need not, and cannot renegotiate the MoU (memo of understanding) is delusional, because he, or she, would be under the understanding that the whole program, the whole process, has remained completely on track ever since the weeks before the Greek first election,” the official said. “Because the economic situation has changed, the situation of tax receipts has changed, the rhythm of implementation of the milestones has changed, the rhythm of privatization has changed — if we were not to change the MoU –it does not work. We would be signing off on an illusion. So we have to sit down with our Greek colleagues and say: this is where we should be in July, and this is where we are in July, and there is a delta. Let’s find out what the delta is and then how to deal with the delta — that is a new MoU,” according to the official. Devaluation would be the optimal way for Greece to jump start its economy. Because that option is not on the table this time, achieving competitiveness is going to be much harder. One of the bailout’s stipulations requires the government to cut pensions, slash the number of public servants and control costs – in other words, the “austerity” option. Others prefer a program to stimulate growth and boost revenue, although one that would likely involve increased spending. This is the “growth” option. Angela Merkel favors austerity while French President Francois Hollande prefers the “growth” option. In this debate, the Germans are in control because they are the ones that are going to cough up the money. They have the ability to help because, contrary to most of Europe, they practice austerity and thrift. If German taxpayers are going to have to pay higher taxes to save nations like Greece, they think their European brothers and sisters should share some of the pain. According to a Washington Post editorial, Germany and other creditworthy E.U. governments were right to tell Greeks before the election that they could not choose both the Euro and an end to austerity and reforms, as several populist parties were promising. Yet now that voters favored parties that supported the last bailout package, it’s time for Angela Merkel and other austerity hawks to make their own bow to reality. For Greece to stabilize, some easing of the terms of EU loans will be needed, at a minimum; an extension of deadlines for meeting government spending and deficit targets may also be necessary. Unless it can deliver such a relaxation, there is not much chance the new administration in Athens will be able to push through the huge reforms still needed to make the economy competitive, including privatizations, deregulation and public sector layoffs. In a sign that no Eurozone nation is completely immune to the shocks of the European debt crisis, ratings agency Moody’s Investor Services has cut the credit ratings of six banks in Germany. The largest bank to be downgraded is Commerzbank, Germany’s second-biggest lender, which was cut to A3 from A2. “Today’s rating actions are driven by the increased risk of further shocks emanating from the euro area debt crisis,” Moody’s said. The downgrade shows that Moody’s thinks Germany could be hit if the Euro crisis becomes a catastrophe. “It brings the crisis in Southern Europe and Ireland closer to home in Germany,” said BBC Berlin correspondent Stephen Evans. The other affected banks DekaBank, DZ Bank, Landesbank Baden-Wuerttemberg, Landesbank Hessen-Thueringen and Norddeutsche Landesbank. In addition to its rating cut, Commerzbank was placed on negative outlook, meaning Moody’s is considering an additional cut. According to Moody’s that is because of the bank’s exposure to the Eurozone periphery and its concentration of loans to single sectors and borrowers. Moody’s deferred a decision on the rating of Germany’s biggest bank, Deutsche Bank. The downgrades are a result of Moody’s concern about the “increased risk of further shocks emanating from the euro area debt crisis, in combination with the banks’ limited loss-absorption capacity”. Moody’s believes that German banks are likely to find themselves under less pressure than many European peers as personal and corporate debt levels are more modest than elsewhere. The agency noted that the downgrades are less harsh than it had originally said they could be. “Moody’s recognizes the steps Germany banks have taken to address past asset quality challenges,” the ratings agency said. The rating actions were driven by “the increased risk of further shocks emanating from the euro area debt crisis, in combination with the banks’ limited loss-absorption capacity,” Moody’s said. “We wanted to identify vulnerabilities from further potential shocks from the euro area debt crisis and how this would affect investor confidence in institutions across Europe,” said Moody’s Managing Director for banking, Carola Schuler. Moody’s agency was especially apprehensive about a potential decline in the value of banks’ portfolios of international commercial real estate, global ship financing, as well as a backlog of structured credit products, she said. “German banks have limited capacity to absorb losses out of earnings and that raises the potential that capital could diminish in a stress scenario.” Moody’s action was anticipated. 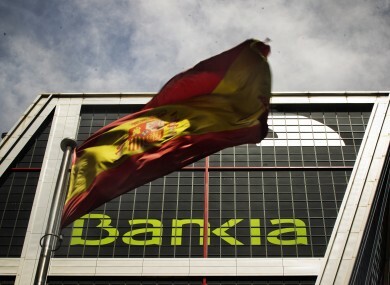 Spain asked the Eurozone for a bailout of up to €100-billion to rescue its banks. This is just a short-term fix for the troubled Eurozone because it doesn’t address the underlying problems in the monetary union. The earlier bailouts of Greece, Ireland and Portugal didn’t resolve the problems either. “The Spanish banking bailout is big enough for some shock and awe (€100-billion vs. talk of €40-billion) but details are murky,” said Kit Juckes, the chief of foreign exchange at Société Générale. The bad news is that Prime Minister Mariano Rajoy’s request for a bailout for Spain’s banks may undermine his political authority and credibility in financial markets. “The emperor’s clothes are tattered,” Simon Maughan, financial strategist at Olivetree Securities Ltd., said. “Unless he uses this money to attack the regions and control the failed cajas, what threads he has left will be stripped off him.” Rajoy has to persuade the Spanish people to accept austerity, and convince bond investors the cuts will deliver the deficit goals he has pledged. if he fails, he may have to return for a larger rescue, potentially draining the Eurozone’s financial ammunition. Protestors demanded to know why billions would prop up broken Spanish banks, instead of helping people who are suffering financially. According to Moody Analytic’s Mark Zandi, the reason why Spain is in so much trouble may sound familiar to Americans. “Spain had a bigger housing boom and bust than we had here in the United States and that means a lot of bad mortgage loans bad real estate loans that undermined the capital positions of the banks. They are broke, they need help from the European Union,” Zandi said. “The Spanish must be very humiliated by having to take the aid. 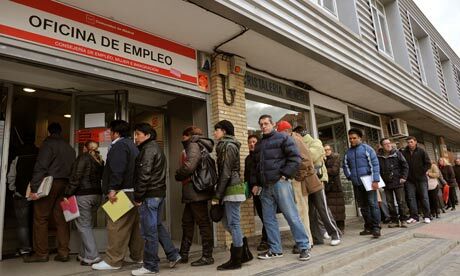 For them to actually have to go to the European Union for help like this, I’m sure was very difficult.” But the pain runs deep with 25 percent of Spaniards is out of work; among the young, unemployment is upward of 50 percent. Catalina Parada is an International, Marketing Consultant and Alter NOW’s Madrid correspondent. She can be reached at catalinaparada@hotmail.com. The world’s largest banks need to raise as much as $566 billion of common equity to meet Basel III rules on capital to be implemented by 2019, cutting shareholder returns, according to analysts at Fitch Ratings. The 29 global banks that regulators believe are too big to fail need new capital that equals nearly 23 percent of the lenders’ current $2.5 trillion of aggregate common equity, according to the report. The median lender could meet the requirements with three years of retained earnings, according to Fitch. Basel III is the latest version of a global regulatory standard on bank adequacy, stress testing and market liquidity risk, requires banks to hold 4.5 percent of common equity, an increase from the two percent under Basel II. The higher standard is an attempt to prevent a repeat of the 2008 financial crisis. International banking regulators meeting under the sponsorship of the Bank for International Settlements in Basel are seeking to implement rules to prevent taxpayers being forced to rescue failing banks. In addition to boosting capital requirements, they are instituting rules on leverage ratios and funding to ensure lenders can withstand future crises. “There’s a shortfall and we wanted to see what covering that implies,” according to Martin Hansen, a Fitch analyst. The Basel III rules “create incentives to reduce expenses further and to increase pricing pressure on borrowers and customers where feasible,” he said. The banks global systemically important financial institutions must hold a special capital surcharge of between one and 2.5 percent of assets weighted by risk. The banks are likely to reduce their holdings of more volatile, lower-rated assets, potentially increasing borrowing costs for weaker companies and reducing the availability of credit. The borrowers’ securities would become harder to trade, forcing companies borrow from less regulated lenders such as private equity firms and hedge funds, according to a Fitch report, called “Basel III: Return and Deleveraging Pressures.” “If banks decide to originate risk and then pass it on to outsiders then it adds to the stability of the banking system,” Hansen said. “Risk hasn’t been reduced, though — it’s been moved from one part of the system to another.” The median return on equity of the 29 lenders was 7.3 percent last year and averaged 11 percent between 2005 and 2011. That is expected to decline to 8.5 to nine percent as the banks make up the capital shortfall, according to Hansen. “Since it is impossible for regulators to perfectly align capital requirements with risk exposure, some banks might seek to increase return on equity through riskier activities that maximize yield on a given unit of Basel III capital, including new forms of regulatory arbitrage,’ Hansen said. Despite Germany’s strong manufacturing output in March, it was not enough to compensate for a slump across the rest of the Eurozone with declining production, a signal that an expected recession may not be as mild as policymakers hope. Industrial production in the 17 Eurozone countries declined 0.3 percent in March when compared with February, according to the European Union’s (EU) statistics office Eurostat. Economists had expected a 0.4 percent increase. The figures stood in stark contrast with German data showing output in the Eurozone’s largest economy rose 1.3 percent in March, according to Eurostat, 2.8 percent when energy and construction are taken into account. “With the debt crisis, rising unemployment and inflation, household demand is weak and globally economic conditions are sluggish, so that is making people very reluctant to spend and invest,” said Joost Beaumont, a senior economist at ABN Amro. According to Eurostat, output declined 1.8 percent in Spain; in France — the Eurozone’s second largest economy after Germany — output fell 0.9 percent in March. Many economists expect Eurostat to announce that the Eurozone went into its second recession in just three years at the end of March, with households suffering the effects of austerity programs designed to slash debt and deficits. “Industrial production is a timely reminder that first-quarter GDP will likely show a contraction,” said Martin van Vliet, an economist at ING. “With the fiscal squeeze unlikely to ease soon and the debt crisis flaring up again, any upturn in industrial activity later this year will likely be modest.” European officials believe that the slump will be mild, with recovery in the 2nd half of this year. The strong economic data seen in January has unexpectedly faded point to a deeper downturn, with the drag coming from a debt-laden south, particularly Greece, Spain and Italy. “It is evident that Eurozone manufacturers are currently finding life very difficult amid challenging conditions,” said Howard Archer at IHS Global Insight. “Domestic demand is being handicapped by tighter fiscal policy in many Eurozone countries, still squeezed consumer purchasing power, and rising unemployment.” Eurozone governments have introduced broad austerity measures in order to cut debt, and these have undermined economic growth. The European Commission hopes Greece will remain part of the Eurozone but Athens must respect its obligations, the European Unions executive Commission said. “We don’t want Greece to leave the Euro, quite the contrary – we are doing our utmost to support Greece,” European Commission spokeswoman Pia Ahrenkilde Hansen said. Greece is likely to face new elections next month after three failed attempts to form a government that would support the terms of an EU/IMF bailout. Opinion polls show most Greeks want to stay in the Eurozone, but oppose the harsh austerity imposed by the emergency lending program. “We wish Greece will remain in the euro and we hope Greece will remain in the euro … but it must respect its commitments,” according to Ahrenkilde. “The Commission position remains completely unchanged: we want Greece to be able to stay in the Euro. This is the best thing for Greece, for the Greek people and for Europe as a whole,” she said. European Central Bank (ECB) policymakers Luc Coene and Patrick Honohan voiced the possibility that Greece might leave the currency bloc and reached the conclusion that it will not be fatal for the Eurozone. According to Luxembourg’s Finance Minister Luc Frieden “If Greece needs help from outside, the conditions have to be met. All political parties in Greece know that.” There are powerful incentives for keeping Greece stable, one of which is that the ECB and Eurozone governments are major holders of Greek government debt. A hard default could mean heavy losses for them; if the ECB needed recapitalizing as a result, that debt would fall on its members’ governments, with Germany first in line. “If Greece moves towards exiting the Euro…the EU would then need to enlarge its bailout funds and prepare other emergency measures,” said Charles Grant, director of the Centre for European Reform think-tank. 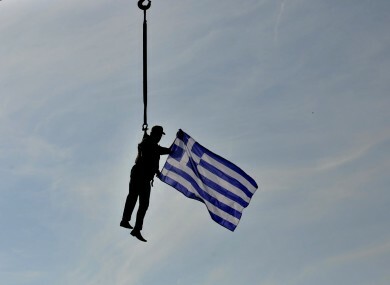 Is Greece Headed Towards a Third Bailout? Greece’s new government will have “about 60 days” to enact long-overdue structural reforms and agree on ways of reining in public debt before officials make a decisive inspection tour in June. “It is very important that there is no let up in the pace of reforms after elections,” said a senior Papademos aide. The chiefs of both the EU and IMF missions to Greece said while progress is being made in meeting deficit-reducing targets, a lot of work remains to be done. “There are still many measures to be taken, painful ones too. I believe we’ll be able to see in the second half of the year in which direction we’re going, whether we’re on the right path or not,” said Matthias Mors, head EU monitor. Private investors in Greek debt wrote down the value of their investment by 53.5 percent, or risk losing everything in a possible default. Public-sector jobs are being slashed, workers ‘ wages are being frozen, welfare payments are being slashed, and taxes are being raised. Greece’s official unemployment rate is currently more than 20 percent. If Greece does default, it could start a domino effect that would drag down other ailing European economies — possibly plunging the Eurozone into recession. Ireland was one of the nations that was hardest hit by the Eurozone crisis, but now it’s being seen as leading stricken nations in their efforts to turn their economies around. International Monetary Fund (IMF) and European Union (EU) officials are impressed by its austerity measures, imposed after the massive 2010 bailout. For the average Irish person, however, the gain is hard to see. Public services have been slashed, and housing prices have declined 60 percent. Approximately 1,000 young Irish people emigrate every week, and there’s extensive cynicism whether economic medicine being taken by the once-mighty Celtic Tiger actually works. Ireland’s unemployment is currently upwards of 14 percent. At the start of Ireland’s second year of austerity, there have been tax rises, wage freezes, layoffs and more. This is being supervised by the so-called Troika, the European Commission (EC), the European Central Bank (ECB) and the IMF. These entities bailed out Ireland after the property bubble burst and its banks collapsed. Larry Elliott, economics editor of The Guardian, describes Ireland as “the Icarus economy. It was the low-tax, Celtic tiger model that became the European home for US multinationals in the hi-tech sectors of pharma and IT. Ireland was open, export-driven and growing fast, but flew too close to the sun and crashed back to earth. The final humiliation came when it had to seek a bailout a year ago. In a colossal property bubble, debt as a share of household income doubled, the balance of payments sank deeper and deeper into the red, the government finances become over-reliant on stamp duty from the sale of houses and the banks leveraged up to the eyeballs. During the time running up to the bubble bursting, Elliott says that “A series of emergency packages and austerity budgets followed as the government sought to balance the books during a recession in which national output sank by 20 percent. In November 2010, the Irish government asked for external support from the EU and the IMF. Again, it had little choice in the matter. The terms of the bailout were tough and there has been no let-up in the austerity. The finance minister, Michael Noonan, plans to put up the top rate of VAT by two points to 23 percent. At least 100,000 homeowners are in negative equity, and welfare payments (with the exception of pensions) have been slashed. In recent quarters there have been signs of life in the Irish economy, but the boost has come entirely from the export sector, which has benefited from the increased competitiveness prompted by cost-cutting. The best that can be said for its domestic economy is that the decline appears to have bottomed out. At least for now. In fact, Ireland’s prime minister, Enda Kenny, recently called for even deeper budget cuts. Kenny outlined savings of up to €3.8 billion needed to slash its national debt under the terms of 2010’s EU/International Monetary Fund bailout. Kenny appealed for understanding from the Irish people and stressed that the nation may have to endure a further two or three harsh budgets to put the country’s finances in order. He said on Saturday that the Republic “was in the region of €18 billion out of line”. “It is the same old story with Ireland in our view — doing good work and will continue to do so,” Brian Devine, economist at NCB Stockbrokers in Dublin said. “But the country is still extremely vulnerable given the level of the deficit.” The anticipated adjustments total approximately eight percent of Ireland’s economy, and follow spending cuts and tax rises of more than €20 billion since the economy began to decline in 2008. Wages for middle-class families have been cut around 15 percent, while the nearly 15 percent unemployed have seen welfare and other aid payments cut. The government recently imposed a new household tax, and is planning new water charges next. Driving a car can mean an annual fee of anything from $205 to $3,045, while recent fuel-tax increase haves taken gas upwards of $7.25 per gallon.